A new level of comfort and Pressure Sore Prevention has been achieved with the Shear Comfort Cushion-It XD1900. The extra dense Merino Wool Pile provides even better pressure reduction than the Australian Medical Sheepskin- as shown by pressure mapping tests ( see below ). Shear Comfort Cushion-Its can be used to soften sling seats and backs and can be placed over existing wheelchair pressure-care cushions to absorb vibrations and distribute pressure. Shear Comfort XD1900 also wicks away moisture to keep the skin dry, so long term use is made more comfortable. A wheelchair can sometimes have an unforgiving seat, built to be sturdy rather than comfortable. Medical wheelchair cushions can also be unpleasant to sit on, being made from non-porous fabrics that restrict airflow to the skin and trigger sweating. By covering your cushion with a Cushion-it XD1900, you can improve the microclimate around your skin without losing any of the pressure reducing qualities of the cushion. The Cushion-It will mould to your body contours, assisting you to maintain a correct posture. Cushion-Its are held in place with nylon straps with velcro attachments. For improved comfort in the car, use 2 Cushion-Its. Wool will reduce pressure, absorb sweat and offer a new level of comfort while travelling. Cushion-It XD1900 is machine washable. Can be dried in the dryer with low heat and slow agitation. Do not overdry since wool does best with 15% residual moisture. Cushion-Its are warranted for up to 50 washes in Woolskin. Use Woolskin for best care. Woolskin will clean condition and disinfect the wool. 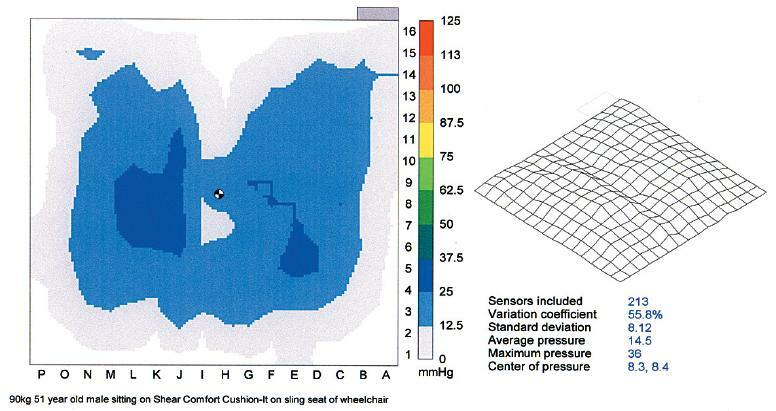 Pressure map of a person sitting on a Cushion-It. All areas show low pressure(blue) and good pressure sore prevention. I use it as a back cussion on my wheel chair to help with a bad bedsore. It makes a big difference.